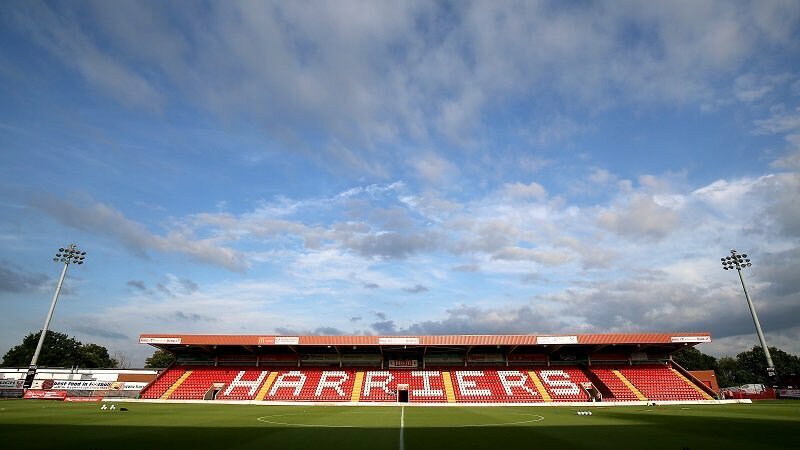 Alfreton Town make the journey to Aggborough on Saturday afternoon for another difficult test against Kidderminster Harriers in the National League North, kick off is 3pm. After last weekend's last minute defeat to Brackley Town, it's been a tale of back and forth for the Reds all season. A solid period of results saw a three game unbeaten league run, which accumulated in three straight draws; defeat to Brackley last weekend has once again set ambitions back. The first half saw good chances for Tom Platt and Richard Peniket only for Brackley to turn the tide and have the better of the second half with Sam Ramsbottom making key saves. It looked to be a fourth draw sealed with a minute or so to go, but Daniel Nti's bundled effort in the 89 minute snatched the points for Brackley when the game looked destined for a 0-0 finish. The Reds have been lacking consistency throughout the season in the league with a four game winning run back in August seeing us rise to as high as third in the table, only for us to record one win in 10 league games after that (Nuneaton 3-1). Recent form for Alfreton has seen two wins in the last nine league games (Ashton 0-2, Boston 0-1). Alfreton will be looking to turn sproadic form around and record some consistency as we head to Kidderminster on Saturday. Defensively, Billy Heath's men have looked good and have become difficult to beat again with just three goals conceded in the last four league games. Potency up front will be an aspect we will be looking to change after firing a blank in our last two outings. We head into Saturday's fixture with one defeat in our last four league outings but in turn have won just one of our last six league games. The Reds have lost just once in the last four away from home (Southport 2-1). Kidderminster sit in 8th place in the table with 40 points from 27 games, two points outside the play-off positions. Their playing record stands at: P27, W11, D7, L9. Harriers have won one of their last four league games with last weekend's 0-1 away win at Telford United ending a run of three straight defeats. Kidderminster have won just twice in their last eight games at Aggborough in all competitions. Aggborough Stadium, Hoo Road, Kidderminster, Worcestershire, DY10 1NB. Adults: £15, Over 60s: £9, Under 16s: £3, Five years and under: FREE. Alfreton fans making their own way to Aggborough, car Parking is available at either end of the stadium, at the South Stand Car Park (£5.00 per car, £10.00 per mini bus and £15 per coach), and Stadium Close Car Park (£3 a match day). No other parking around the area of the stadium is permitted. Alfreton Town 3-3 Kidderminster Harriers (Saturday 4th August 2018): We played out a six goal thriller at the Impact Arena on the opening day of the season back in August. Dan Bradley gave Kiddy the lead before headers from Tom Platt and Tom Denton ensured a 2-1 lead at the break for the Reds. Kane Richards and Joe Ironside swung the contest back Harriers way in the second half before Bobby Johnson's late penalty secured a point.